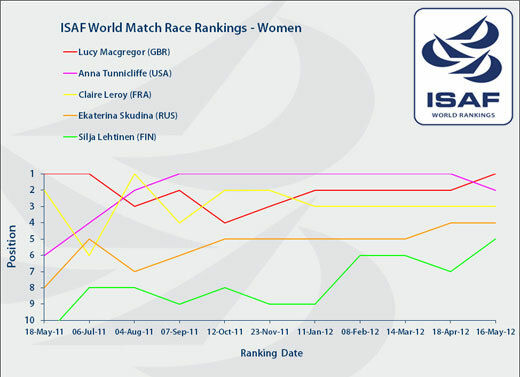 After seven months on top of the ISAF Womens Match Racing Rankings Anna Tunnicliffe (USA) has been knocked off the top by Lucy Macgregor (GBR). Making it an all British affair in the ISAF Match Race Rankings is Ian Williams who remains on top in the Open Rankings. Despite picking up gold at the Semaine Olympique Francaise in Hyeres, France, ISAF Rolex World Sailor of the Year Anna Tunnicliffe (USA) has been knocked off the top of the Womens Rankings by Lucy Macgregor (GBR). Both sailors count consistent results amongst their rankings points within the last two years with very little separating them. Several key regattas are on the horizon and more movement is expected as Claire Leroy (FRA) will also challenge for the World #1 spot. Australias Olivia Price continues her march up the Womens Rankings at a rate of knots and moves up to a personal best of World #9. The Australian has been showing good consistency in 2012 with a number of podium finishes and following a ninth place in the big Hyeres winds she breaks into the top ten for the first time. 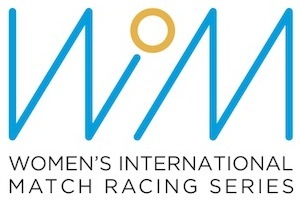 With many of the London 2012 Womens Match Racers ramping up their preparations many of those aiming for the national selection are moving towards the top of the rankings. The next release of the ISAF World Match Race Rankings will be 13 June 2012.